With GasPedal you start into a new era of analyzing your data both visually and quantitatitve in one well-integrated software platform. Nearly 20 years of innovation, experience and knowlegde in software development for the analysis of 2D-gel-electrophoresis images now meet in GasPedal. 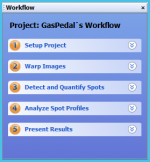 GasPedal combines fast visual analysis, exceptionally reliable spot matching and quantitation with versatile tools for sorting, filtering and annotating spot data, as well as exceptional powerful statistical tools, in one easy to learn application. Import your raw data in CDF or mzML format directly into GasPedal and get a two-dimensional chromatogram image within seconds. Always stay linked to your raw data by instantly accessing your spectra at any location on your images. Use them to compare spectra from different runs (e.g. to support matching) or quickly copy spectra into the clipboard to search in external databases like NIST without any hassle. Warp Images: Eliminate possible running differences between the GCxGC runs automatically. 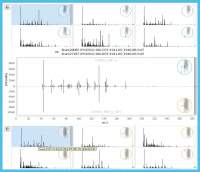 Optimize the warping comparing spectra on pairs of chromatogram images. Detect spots on an artifical two-dimensional GCxGC image, which merges all information of your complete experiment, and Quantify Spots using the consensus spot pattern tranferred on every image. This avoids missing values. Analyze Spot Profiles quickly by using the filter and sorting capabilities, or investigate your spot profiles in-depth with powerful statistical methods to approve your final list of interesting volatiles. Present Results e.g. in unique eye-catching HTML reports, presentation slides, or simply in tables for external processing. GasPedal, the easy to use software solution, will let you extract more information from your GCxGC runs – in a fraction of the time.